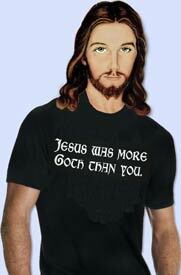 Jesus was more Goth than you. – he is referred to as Lord Jesus. – he was into fishnet. – he went to dens of iniquity. – he had the gaunt look down. 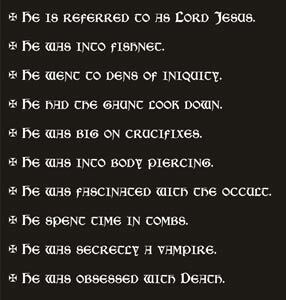 – he was big on crucifixes. – he was into body piercing. – he was fascinated with the occult. – he spent time in tombs. – he was secretly a vampire. – he was obsessed with Death.